Lajos von Micsky was born in 1918 in Hungary. He entered an Obstetrics/ Gynecology residency at the Columbia University, New York in 1959. Working at the St. Luke Medical Center he devised many innovative ultrasound scanners in the 1960s, largely for abdominal scanning. He also fabricated a number of trans-vaginal, trans-vesical and trans-rectal devices that won much acclaim from his contemporaries. Perhaps he was somewhat less well-known than other ultrasound pioneers because he did not publish on many studies that would make him well-known in the academy and in the field of ultrasound research. He passed away in 1976 in a cardiac attack at the age of 58. Sadly, he was not able to see his equipment bearing fruit from the advent of gray-scale in the mid-70s. 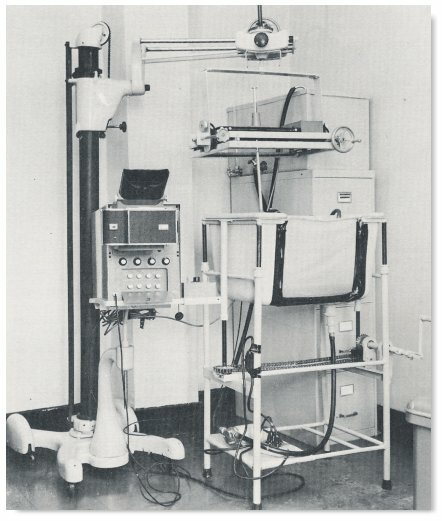 This was one of Von Micsky's equipment in the early 1960s which consisted of an ultrasonoscope from Hoffrel® Instruments and rectangular co-ordinate scanner gantry mounted on a portable X-ray stand. The patient stands in front of the scanning tank with her abdomen pressed against a thin membrane partially replacing the container's anterior wall. Sonic coupling was effected by glycerine applied to the skin of the abdomen.The equipment was equipped with marker circuit, electronic magnification circuit, sensitivity depth compensation and electronic contrast enhancement circuits to permit the recording of gray tones. 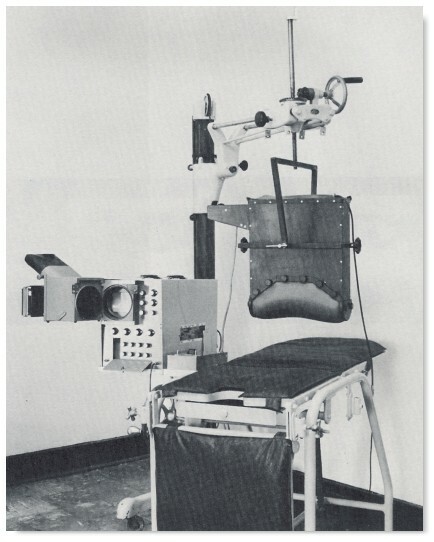 This was another of von Micsky's innovative abdominal scanners constructed specifically for diagnosis in obstetric patients. 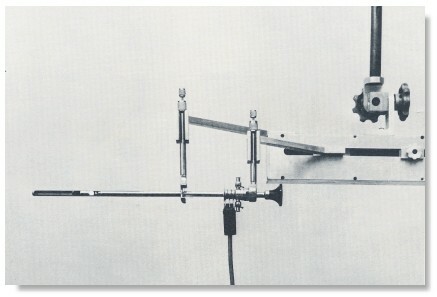 It consisted essentially an anechoic chamber, the lower aperture of which was covered with an elastic membrane. It could be positioned over any contours in any plane. The degree of molding of the membrane to, and the actual pressure on the abdominal wall was adjustable by increasing or decreasing the vacum in the uppermost part of the chamber. A Intravesical scanner for delineating pelvic pathologies. von Micsky used it to look at the uterus and the cervix. From von Micksy's paper "Ultrasonic Tomography in Obstetrics and Gynecology" presented at the First Internation Conference on Diagnostic Ultrasound held in Pittsburg, Pennsylvania in 1965.